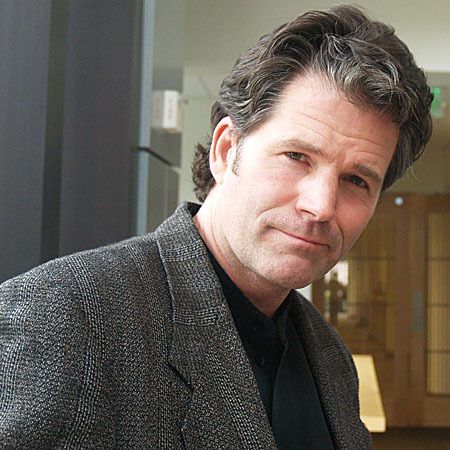 Andre Dubus III is most recently the author of The Garden of Last Days. Condition of the Show: Plagued by decaying verdure and intrusive catering managers. Subjects Discussed: The propinquity of Roman numerals after surnames, Richard Flanagan’s The Unknown Terrorist, Heinrich BÃ¶ll, books being categorized as post-9/11 novels, on letting a book go after publication, political novels, writing longhand in cars, Tobias Wolff, the car as shared confessional experience, Flannery O’Connor, writing as a dreamworld, verisimilitude, getting an approximation of an outsider’s character or experience, “White Trees, Hammer Moon,” prison, capitalism, serial description in a declarative sentence, considering the reader, realism vs. postmodernism, self-indulgence in writing, Blaise Pascal, the dangers of the author pleasing himself, taking twenty-five years to write a novel, Dubus’s beverage motif, whether or not specific details in a novel are symbolic, the advantages that come from confined and sustained narratives, sensuality, writing in short sustained bursts, vicarious moral outrage, poems and Books on Tape, T.S. Eliot’s The Waste Land, an interruption by a catering manager, Dubus’s early life bumping around, the responsibilities of a novelist, honesty, novelists who impose endings on books, fiction as a pack of lies vs. fiction as truth, Picasso, sincerity, characters who become truer than real people, and the absence of fathers and husbands in The Garden of Last Days. Dubus: Oh, this is fascinating. Correspondent: So there’s a certain coffee-alcohol axis I had to ask you about. Dubus: Well, God, it just sounds like a weekend in my life. Dubus: Drink Friday night, drink coffee on Saturday morning. Fascinating. Wow. I hadn’t even known that. Listen, I do believe that we live in our bodies. Even those of us who live very ethereally from the chin up. And I truly believe that these central details shape us and guide us. You know, I had this experience a few years ago where my wife and I had a little spat over money the first thing in the morning. My coffee was cold, gone cold during the fight. I get in the car. It hardly starts up. And I’m worried about money and can I fix this clutch. I drive off. A guy cuts me off in his truck. And I’m telling you. If that car could go fast, I’d go down the road, rip him off the truck, and beat on him. Dubus: This stuff isn’t unimportant? Correspondent: It’s important. But I’m curious. You have to be aware — since there is so much coffee in this book — that you’re repeating this symbol over and over again. So readers like me say, “Well, coffee. Might be a symbol.” Or as we’re suggesting here, it may not be a symbol at all. It may just be some aspect of the world you’re drawing from that just happens to repeat itself. Dubus: But, Ed, man, I really believe that the reader tends to know more than the writer. At least, certainly in my case.